Aberdare Cemetery Memorial Gates commemorate those who died in service or were killed in action during World War One. The official opening of the Aberdare war memorial was carried out on Saturday afternoon, in the presence of a large gathering of citizens and the committee responsible for its erection. The memorial takes the form of four stone pillars handsomely designed, and iron gates at the entrance to the Aberdare general cemetery. The speakers paid tributes to the valour of the men who served during the war and reference was made to the splendid response made by the men of Aberdare, twenty-one of whom, according to the roll of honour, paid the supreme sacrifice, while an additional 48 more had gone and returned. 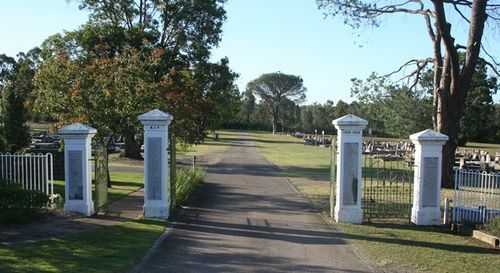 Tribute was also paid to the good work of the committee responsible for the erection of the gates and honour roll. The work was carried out at a cost of £250, and is a very fine piece of masonry, being executed by Mr. Blackford. The Maitland Daily Mercury (NSW) 7 September 1925. Erected by the Aberdare Memorial Committee. Mrs S. J. Hartsorn Treasurer.